Hyperlinks are not active, even if you put in the http://. Seasoned page administrators may remember that hyperlinks were allowed in the prior About box feature (sigh...RIP About box hyperlinks). The information provided in the about box is also displayed/repeated on the info tab. Page managers can edit the information in the About box via the page manager (Edit Page > Basic Information > About) or by selecting the “edit” link at the top of the box. Present your message in 5 lines or less of text so that your users do not have to click any additional links to see the full text in the box. 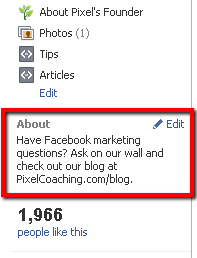 Include a call to action that encourages engagement on your wall, or people to like your page. Consider your key words. It is likely that this box is indexable (anyone able to offer a confirmation of this?) as pages are public and items like the page name and wall content are scanned by the search engines. So what are you going to put in your About box? Share a link to your page or post your pitch in the comments. We love seeing your page marketing efforts!